Playoff Round 1: A Tiebreaker Wing Off! Wowsa! Four great teams competed Thursday, August 8th, which resulted in a 3-way tie! Just one wing separated all the teams. Brooke’s Brothers were soooooo close, but the teams advancing to the Tiebreaker Wing Off were: #CTBrewCrew, Wings of Glory, and The Mad Men. 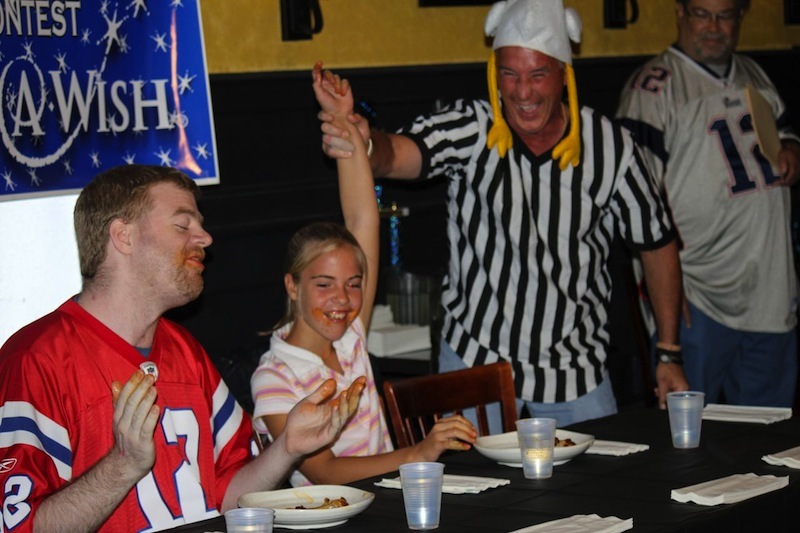 Each team picked one person to compete; they had 1:30 to eat as many wings as possible. And guess what? Another tie! So both teams – Wings of Glory and The Mad Men – are advancing to the Finals on Thursday, August 22nd. Congratulations! And, congrats to #CTBrewCrew! Though they didn’t receive an automatic berth to the Finals, they did win Best Costume/Best Cheerleaders. Check out the pictures below.